As the US Postal Service will no doubt be this week's target of Right and Left wing noise machines, and assorted partisan nitwittery, and Glenn Beck is sure to attack it as another wing of ACORN, I felt a short reader was called for. As always, if you have items to add, email me, tweet me, or post as a comment. 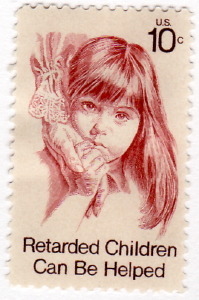 Before you flame me savagely, the image at right is an actual USPS stamp from the early 1970s. Times have changed. The mail has to. It's time to admit it's not a profit making enterprise, and doesn't have to be run like one. WASHINGTON, March 2 (Reuters) – The U.S. Postal Service, faced with a dwindling number of customers and growing shortfalls, plans to raise prices, cut costs and ask for rule changes to make the struggling service more flexible, Postmaster General John Potter said on Tuesday. AP Explainer/FAQ — How did the U.S. Postal Service get in this fix? Covers the basics and the key issues of the current crisis. Five myths about the U.S. Postal Service — Important reading before shooting your mouth off in public. Posted in Politics, U.S. Postal Service.